At most high schools across America — even the very best — there are too many students and too few school counselors. And there are even fewer school counselors who get the highly selective college admissions process. We’ve been saying for years that at so many high schools across America, there simply aren’t enough school counselors to go around. 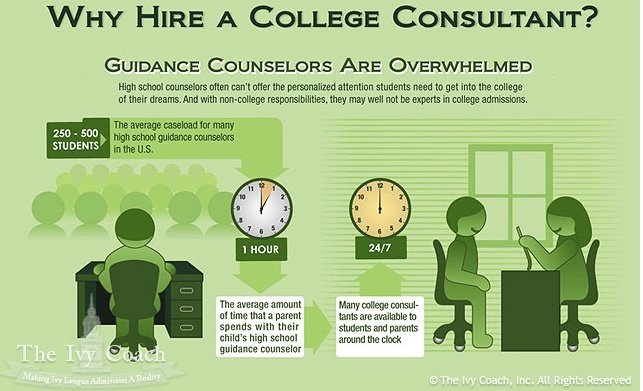 A “New York Times” article this week entitled “Little College Guidance: 500 High School Students Per Counselor” adds another voice to the choir, championing the notion that more school counselors are needed to help students with the admissions process. It’s a notion not lost on the Obama administration, which just a couple of months ago issued a White House report that recognized the need for not only more school counselors but more school counselors who are well versed on the college admissions process. More, after all, doesn’t always mean better and at the vast majority of high schools across America, school counselors aren’t adequately trained in the college admissions process. Much less the highly selective college admissions process. So what happens when a student has a school counselor with 499 other students? Chances are good that this student will end up with a recommendation letter that reads like a form letter. Change a couple words here, insert a different name and the letter can be applied to just about anyone. And this is not lost on highly selective colleges. So how to aid your school counselor in crafting a letter that says who you are and what you’re all about? Well, write what you’d like your school counselor to say about you to your school counselor. Chances are high that your school counselor will not only find this helpful but use it verbatim. And that’s a good thing. So long as what you wrote is good stuff. And chances are what you wrote isn’t good stuff because, we’ve found, that the vast majority of students and parents don’t realize what admissions officers actually love to read. They think they know what admissions officers want to read and, in just about every instance out of ten, they’re quite wrong. Just like they say in “Jerry Maguire,” (sort of) you’ve got to help your school counselor help you. When your school counselor has about 500 students — or even 250 — they need help. So help them help you. It’s that simple. And, of course, hire a private college counselor. But not just any private college counselor. There are thousands of them. And the vast majority of private college counselors aren’t very good either. Only hire the best.